Veterinarians use an old remedy to eliminate the deadliest infectious disease known to humanity. Rabies. It was the season for guavas. Their sweet musky fragrance drifted through the morning air and into the open window of seven-year-old Sharon Korir, beckoning her outside to play. The year was 2003, the day after Christmas. As was customary, Sharon had traveled with her parents to their home village in rural Kenya for the holiday. When it came time to return to Nairobi, the doting grandparents asked Sharon to spend an extra day. The rains had passed and that day arrived with welcome blue skies. Sharon and her friends ran from yard to yard, climbing the guava trees and picking the succulent fruit. While crossing a neighboring compound, however, their laughter awakened a sleeping dog. Confused and snarling, the skinny dog gave chase as the children fled. Sharon, the smallest of the bunch, lagged behind and within moments was knocked down and bitten. All seemed well as Sharon started back to school in January but soon Agnes received a call from the nurse saying Sharon was vomiting badly and falling asleep. They rushed her to the hospital. In shock, Agnes watched as her daughter crumpled to the floor. By now, the doctors suspected rabies and concluded improper procedures had been used when Sharon was first treated in the village clinic. Sharon had become one of the 2,000 Kenyans, mostly children under the age of 16, who die from rabies each year. One more case that adds up to the 59,000 human deaths reported annually worldwide. Ninety-nine percent of these cases result from dog bites, and once symptoms appear, rabies is nearly 100 percent fatal—the deadliest infectious disease known to man. Although an experimental treatment did save a Wisconsin girl in 2004, it has not proven successful for other victims. Though it’s too late for Sharon, scientists now know there is an easy way to prevent such heartbreaking tragedy. In the United States, the rabies virus survives in wildlife populations such as the fox, skunk, and raccoon and is therefore difficult to eliminate. But in Africa, research shows that domestic dogs are the primary reservoir—or infected group of animals—responsible for transmitting the disease. Vaccinating dogs shrinks that reservoir and stops the spread to humans and wildlife. That discovery by epidemiologist Sarah Cleaveland at the University of Glasgow was a game changer, says Guy Palmer, Regents professor and founding director of the Washington State University Paul G. Allen School for Global Animal Health. Scientists had long considered the elimination of human rabies to be an impossible goal, but Cleaveland’s findings suddenly put it within reach. In response, the World Health Organization formed an international alliance aimed at ending all human deaths from rabies by 2030. Palmer and the Allen School recently joined the effort through an ongoing pilot project in East Africa that has shown impressive results. With key colleagues in Kenya, Tanzania, and Scotland, WSU oversees a region-wide rabies eradication program that has dramatically reduced the number of human and wildlife deaths in East Africa. With adequate funding and public support, Palmer believes rabies can one day join the ranks of smallpox and rinderpest—viral diseases that scientists have previously vanquished. And in so doing, abolish a scourge that has tormented humanity for over 4,000 years, its agony immortalized in Egyptian hieroglyphs. 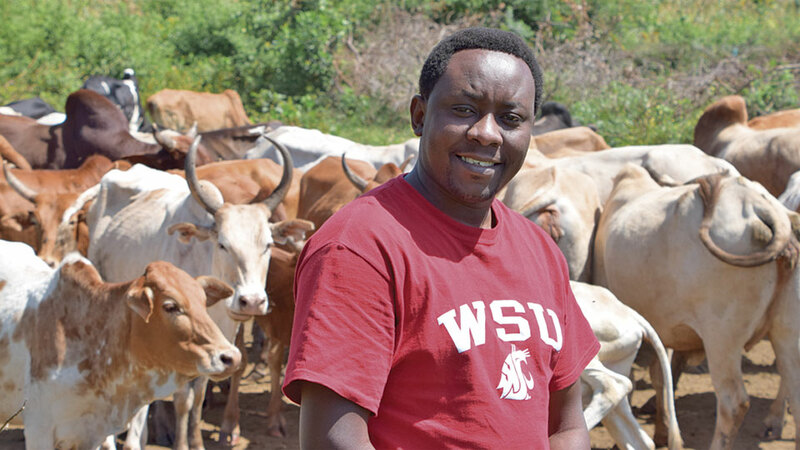 I take a seat in a tiny room on the WSU Pullman campus and, through the wonder of a 360-degree camera and virtual reality goggles, am transported to rural Tanzania. There, a chaotic scene unfolds as Palmer, WSU clinical assistant professor Felix Lankester, and Tanzanian veterinarian Imam Mzimbiri busily supervise a rabies vaccination clinic near the town of Bunda. The air is stitched with piercing squeals and puppy yips. School boys of all ages, along with the occasional girl, pass by with dogs in tow, heading for a place in line. Most have walked several miles to bring their family pets to the clinic where they receive free rabies vaccinations and information about the disease. As the children quietly chat, technicians scurry about recording information and veterinarians struggle to inject squirming canine patients. By the end of the day, hundreds of dogs and a handful of cats will have passed through the line, joining the more than one million animals vaccinated since the program’s inception. WSU first became involved in 2007 when Palmer says the newly established Allen School began seeking ways to fight zoonotic diseases through intervention at the human-animal interface. Based on his previous laboratory experience with the virus, Palmer suggested they tackle rabies, an often ignored and poorly controlled infection that causes terrible suffering. It fit the bill perfectly. In short order, he invited Cleaveland to Pullman for a brainstorming session. The renowned pioneer in East African rabies research says she and Palmer discovered a shared philosophy and scientific approach. It quickly developed into a strategic partnership. Much of Cleaveland’s research is conducted through the Serengeti Health Initiative (SHI) in Tanzania which strives to preserve wildlife and ecosystems surrounding the Serengeti National Park, while also helping local people like the semi-nomadic Maasai. The initiative includes a rabies vaccination program. In 2012, his pilot project thriving, Palmer joined forces with SHI as a partner in the rabies control program. He also recruited SHI director Lankester to the WSU faculty. I catch up with Lankester via Skype early one morning as he and his family prepare to fly from Nairobi to England for the Christmas holiday. After 13 years in Africa, he’s seen more than his share of rabies. “In domestic dogs, it can present in a wide variety of ways,” he says. “There is the classic furious type where the animal is aggressive, out-of-control, and frantically trying to bite. But they can also be quiet, depressed, lying down, and having seizures. Photographs of the encounter, taken in the Ngorogoro Crater, show the lioness apparently stunned with disbelief before clawing the small dog from her cheek. She holds him down with a paw, but he frees himself and eventually chases her off into the bush. Lankester alerted park veterinarians who were able to locate the lion and dart her with rabies vaccine. Post-exposure prophylaxis or PEP is a vaccine or immune globulin treatment given after bites to help thwart an otherwise fatal rabies infection. Indeed, rural families face the anguish of a Sophie’s Choice if their children are bitten. “They must decide that the dog might have been rabid and spend the approximately $150—or two months’ wages—on a post-exposure vaccination course, if they can find one,” says Lankester. “Or, decide that the dog wasn’t rabid and save the money and take the risk. It’s a terrible choice and sometimes they get it wrong with tragic consequences. But living in such poverty, you need to be very sure that the dog was infected before spending the money, a cost which could prohibit another child from attending school. Lankester has channeled his passion into progress. Through program efforts, wild carnivores in the Serengeti National Park are now free of domestic dog rabies and the incidence of human rabies has dropped to almost zero. In the past, frequent outbreaks led to the extinction of the park’s African wild dog population and the deaths of many children each year. Despite their success, areas beyond park borders still harbor pockets of rabies that can be easily transmitted by wandering dogs or dog-infected wildlife. To counter that possibility, Lankester is promoting a regional vaccination campaign aimed at creating large, rabies-free zones throughout Tanzania. A similar story plays out in neighboring Kenya, where WSU clinical assistant professor Thumbi Mwangi helped organize Africa’s most progressive rabies control program. I call the cheerful Kenyan on Skype, as he enjoys late afternoon sunshine by the shores of Lake Victoria. For the last two weeks, Mwangi has been holding rabies vaccination clinics near the town of Bondo. As is typical, each clinic is staged at a primary school within walking distance of everyone in the area. And just like in Tanzania, it’s a lively scene of kids and dogs. 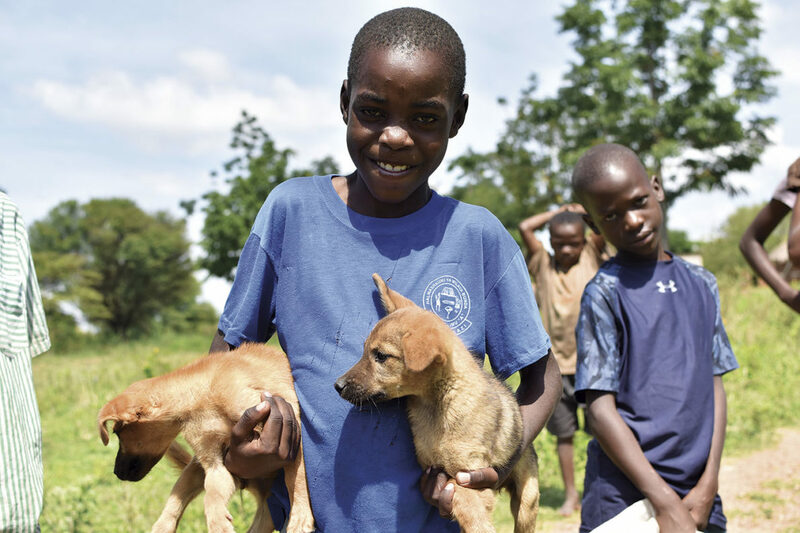 So far, Mwangi’s team has vaccinated 15,000 dogs, or about 70 percent of the local population, which is enough to stop the disease from propagating. In a few days, technicians will follow up with a household survey to verify they’ve reached that goal. Mwangi, an epidemiologist with a love of statistics, was recruited by Palmer in 2012 to investigate the prevalence and impact of One Health diseases throughout Kenya. According to the Centers for Disease Control and Prevention, six out of ten infectious diseases in people are contracted from animals. One Health programs focus on the links between human health, animal health, and the environment. Traveling the country, Mwangi soon made a name for himself and caught the eye of government officials who entreated him to develop a national rabies control program. He accepted eagerly, devouring every study he could find on the disease including Cleaveland’s innovative work at SHI. Eventually, Mwangi concluded that eliminating rabies was a real possibility. He was tasked with finding a way to make it happen. Today, Kenya’s rabies control program could be a successful role model for other African nations. “Kenya was an early adopter of One Health issues and gave them priority,” Mwangi says. He says it is all part of their proposal to make sure that by 2030 not a single child will needlessly die from the disease. He describes a 2014 case where a family of seven was attacked by a hyena. Mwangi read about it in the newspaper with his colleagues. “We discussed how strange it was that the hyena had fought the family for over an hour,” he says. “We talked about it and said, ‘Let’s get the head.’” They did and it tested positive for rabies. “The children and the mother had severe deep cuts,” says Mwangi. “Using some of our own money, we managed to get them all PEP plus rabies immunoglobulin to infuse on the wounds. It worked and they all survived. If you recognize it in time, you can end up saving an entire family. We later heard the woman became pregnant and was blessed with twins. The organization advocates rabies awareness and provides vaccinations for dogs, cats, and donkeys, as well as PEP. 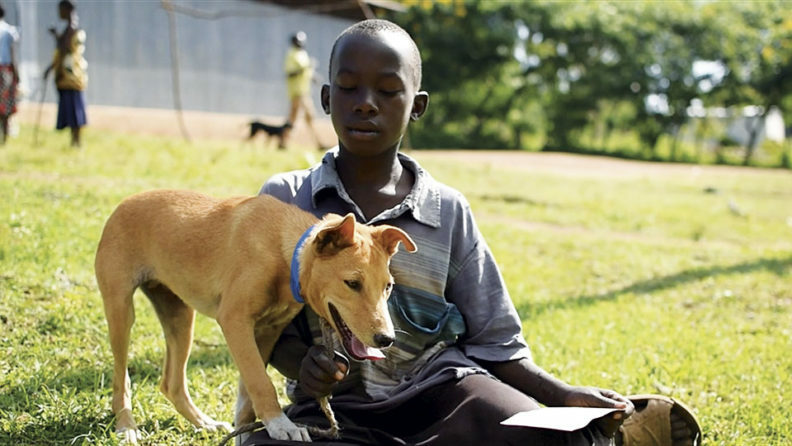 They have funded over 100,000 doses to date and, through international contributions and partnerships, hope to see Kenya become the first African nation to successfully eliminate rabies. Palmer says there’s still a long road ahead despite his collaboration with the Global Alliance for Rabies Control, the Pan-African Rabies Control Network, and smaller nonprofit organizations like Sharon Live On. 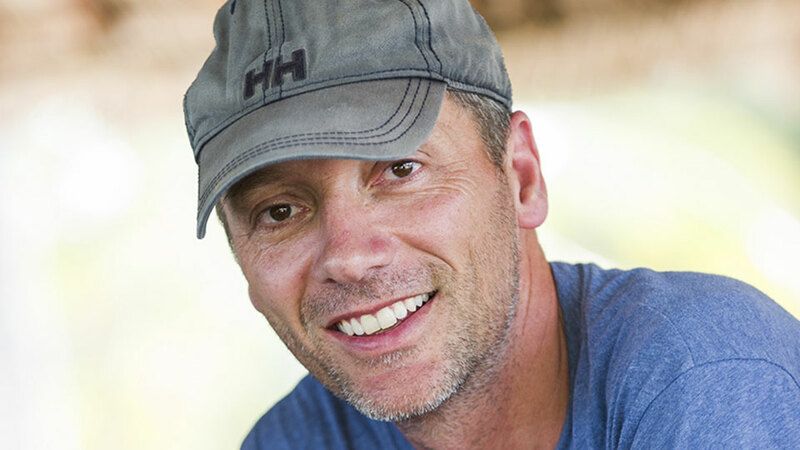 He reports that only ten percent of bite victims are currently able to complete the full post-exposure prophylaxis treatment. It’s one more reason to push for dog vaccination—which, thanks to Lankester, just became abundantly more accessible. One of the biggest hurdles to achieving rabies eradication in Africa has long been the lack of electricity for vaccine refrigeration in rural areas. To compensate, veterinary teams would travel to the furthest refrigerated village, store the vaccine overnight, and the next day transport it in coolers to remote areas. It wasn’t enough. Searching for ways to expand their outreach, Lankester turned to the vaccine itself. In a recent study gaining worldwide notice, he showed that commonly used canine rabies vaccines can be stored at elevated temperatures and still be effective; specifically, up to six months at 25 degrees Celsius (77 degrees Fahrenheit) or three months at 30 degrees Celsius (86 degrees Fahrenheit). “It’s a quite remarkable result, as it showed the vaccine was thermostable at fairly high temperatures,” he says. “Having a vaccine they can safely store in the villages is an exciting development in our ability to control rabies.” And one that will allow coverage in isolated areas occupied by the Maasai herdsmen whose children are especially vulnerable. 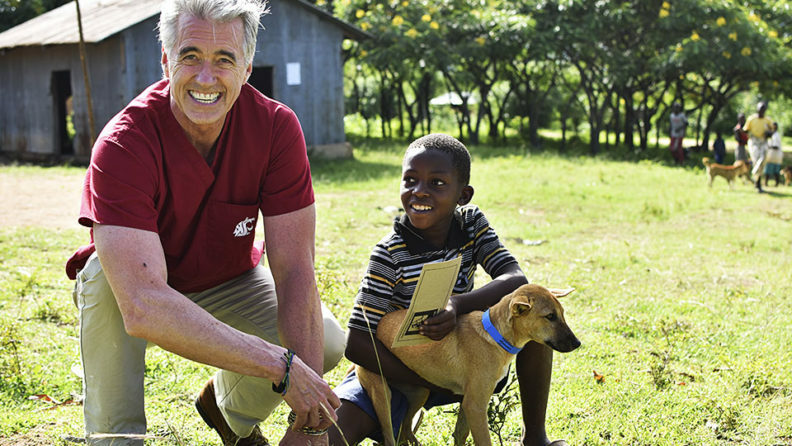 Palmer is also encouraged by the stateside success of their Eliminate Rabies Project, a fundraising partnership with veterinary clinics in the Pacific Northwest and beyond. One of the partners is Kyle Frandle ’74, ’76, ’80 DVM, owner of Los Gatos Dog and Cat Hospital in Los Gatos, California. He is also an adjunct professor with the WSU College of Veterinary Medicine. Frandle accompanied Palmer and Lankester on a 2013 trip to East Africa and says the experience opened his eyes to the need to become involved with the program. “Veterinarians are the world’s experts in rabies,” he says. “We get so wrapped up in our exam rooms and surgery suites that we don’t get out and use the knowledge as we should. It’s unacceptable that 25,000 children die from rabies in Africa each year when there’s a readily available vaccine that’s been around for 135 years. “At our clinic, we donate a dollar for every rabies vaccination we give, and I’d like to see that become a nationwide project,” says Frandle. That’s Swahili…for thank you very much. Eliminate Rabies: At the Paul G. Allen School for Global Animal Health we are working to eliminate canine rabies worldwide. The WSU Rabies Vaccination Program team vaccinates an average of ​300 dogs each day in east Africa.